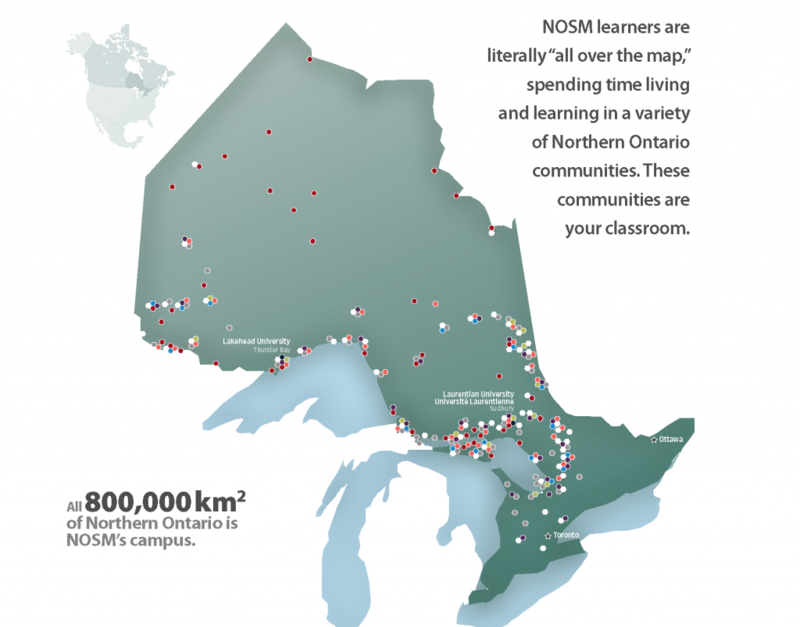 NOSM’s education is quite literally “all over the map,” taking learners out of traditional classrooms and into your community. NOSM learners are educated in your community about the local culture, economic realities, and social determinants of health that are relevant here in the North with the hope that their experiences will win over their hearts and minds, and encourage them to return to practise in the North upon completion of their education. And it’s working. The majority of NOSM learners do remain to practise in the North. The walls of the Northern Ontario School of Medicine are the boundaries of Northern Ontario and span 800,000 km2 that include Indigenous, Francophone, remote/rural communities, and urban centres. Below are 63 profiles of the more than 90 communities where NOSM students live and learn.